Well, another year at the High Pasture Cave site has slipped by and it is almost time to put the covers on the open trenches for the winter. We still have a few days of tidying up to do, the odd bit of recording here and there and preparations to be made in advance of the laser scanning work, which will be carried out by AOC Archaeology in early October. I will provide details of the scanning work and any other news in the next update, but for now will provide details relating to the last few weeks on site. As usual, I will deal with this by trench. Generally, the weather has been quite unsettled at the High Pastures site over the past three or four weeks, but this has not stopped us from achieving our main aims and objectives. 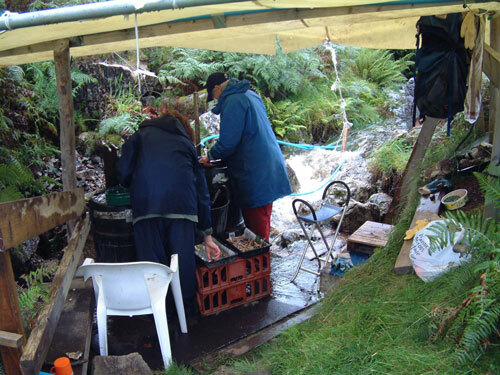 The image above shows Ann and Stephanie working at the wet-sieving area where the stream sinks underground. On this day, we saw a rapid rise in water-levels due to the prolonged and heavy rain, which also resulted in some of the surface trenches becoming waterlogged. Combined with the midges, calm and damp weather gave rise to some quite difficult working conditions. However, this did not deter the site volunteers and we managed an impressive amount of work. Work in Trench 19 has continued well, although we have made few finds in the basal layers below the burnt mound deposits. 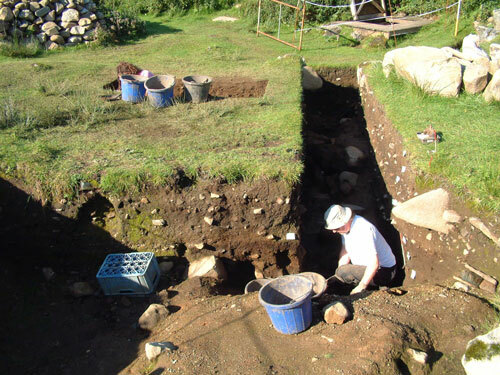 The image below shows Kath excavating in the vicinity of the walls and other features uncovered below the burnt mound in this part of the site, and Ann working in Trench 20 at back left. 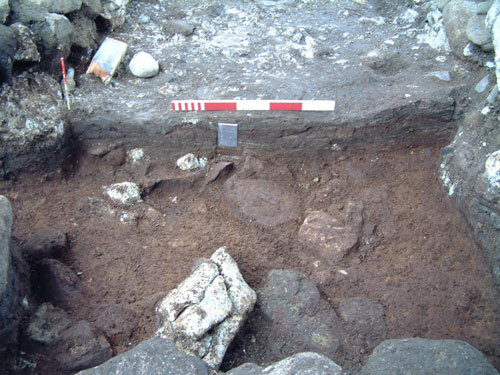 Steven finally completed the excavation of one of the post-holes in this area of the site, which produced a few charcoal fragments for radiocarbon dating and a flint flake. The image above shows the location of the post-hole, at the bottom of the shot, in relation to the revetment walls, or wall footings, further up the trench. The post-hole appears to have two phases. 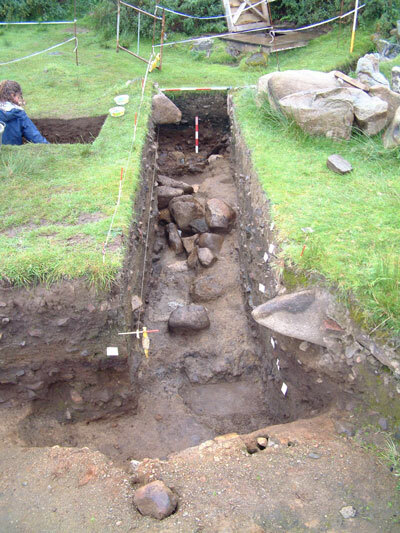 The image below shows the partially excavated post-hole with packing stones. The fill of the original cut for the post-hole contains a brown/orange sediment and in this views can be seen to the left of the upright packing stone. The fill relating to the second post is a darker sediment, rich in charcoal fragments, to the right of the upright packing stone (scales = 0.2m and 0.1m). The flint flake was recovered from the primary fill of the post-hole; while the hole itself when excavated was in the region of 0.65 metres deep. 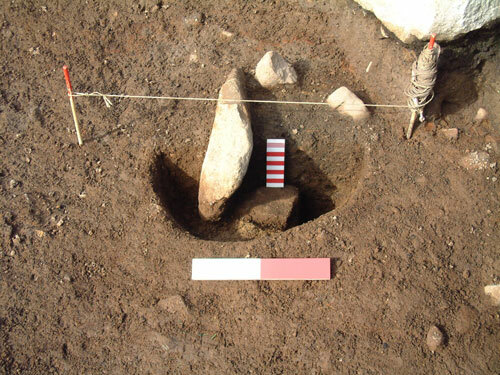 The image below shows the post-hole after excavation with two of the packing stones still in place (scale = 0.2m). Work will continue in this part of the site in 2009, when we will have to undertake some extensions to the trench to evaluate adjacent features. The results of excavations in Trench 14, adjacent to the caver’s entrance, continue to be difficult to interpret. Here, we have evidence of what appeared to be some form of structure associated with burnt mound material and charcoal-rich silts. At first, we thought this may be the remains of a tank to hold water, a major part of the infrastructure that we would expect with a ‘typical’ burnt mound. The image above shows George and Stephanie working in Trench 14, while the image below shows the stone-built structure (scales=1m and 0.5m) and Stephanie working within the trench extension, excavated to evaluate further this enigmatic pile of stones! The trap-door of the caver’s entrance can be seen beyond. is just off picture at the top of the image, which will hopefully show the continuation of the structure beyond. 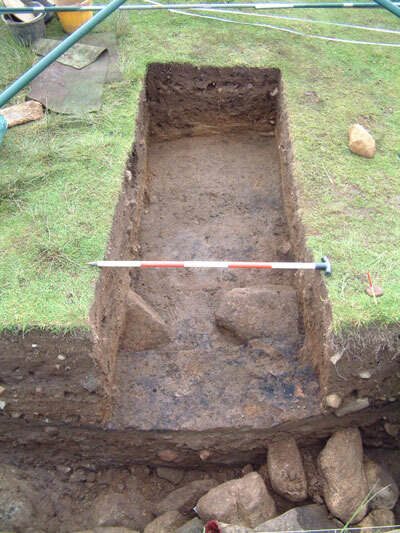 The image below shows the trench extension under excavation - note the charcoal-rich areas of silty deposits at this level, which also shows in the section of the main slot trench (scale = 1m). Further work is required in this trench and we will hopefully be able to clarify any results in the next news update from the site. I reported on the initial excavations in Trench 20 in the last news update. 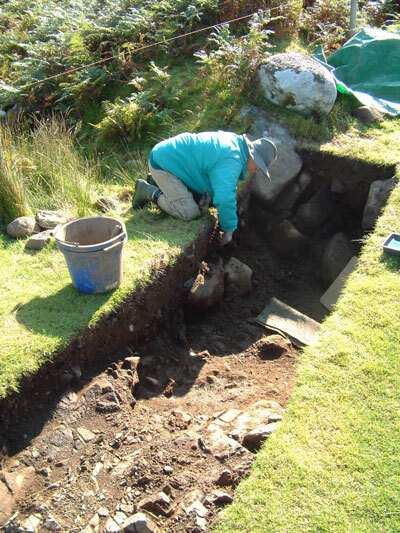 At that time, we appeared to be excavating some type of feature - possibly an infilled road, entrance-way or hollow-way that entered the site. Although we will have to carry out small extensions to this trench to fully evaluate the feature, up to now we have uncovered a definate cut in the volcanic dyke that passes through this part of the site that has been filled with a dense deposit of fire-cracked pebbles (burnt mound deposits). We have had a few finds from the trench including iron slag, the possible remains of a small iron pin, and a small bronze ring - of uncertain function. The image above shows Ann Wakelin excavating in Trench 20, while that below shows the excavated feature from the northwest (scales = 1m and 0.5m). 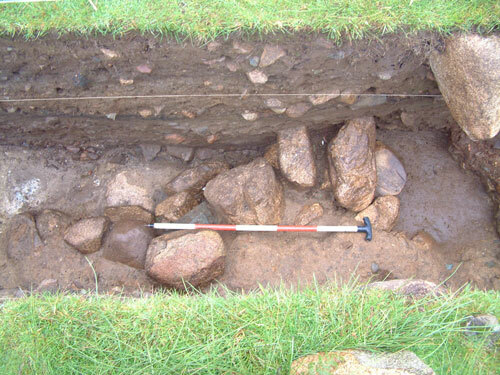 The cutting through the dyke bedrock would have been quite labour-intensive, so it will be interesting to provide a more detailed picture of the feature and what was taking place in this part of the site. Excavations in Trench 17, in Bone Passage (cave), are now complete and we have finally removed the last of the archaeological deposits from this part of the site that were threatened by the activities of caver’s. 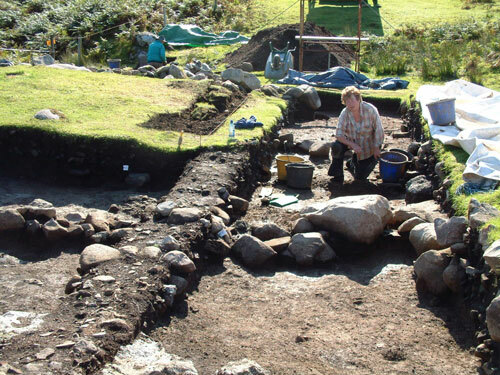 The final excavations included the north end of Bone Passage and the ramp leading down into the main stream passage. The excavations continued to produce a few sherds of pottery, red deer antler, animal bone and shellfish remains - but few other finds. 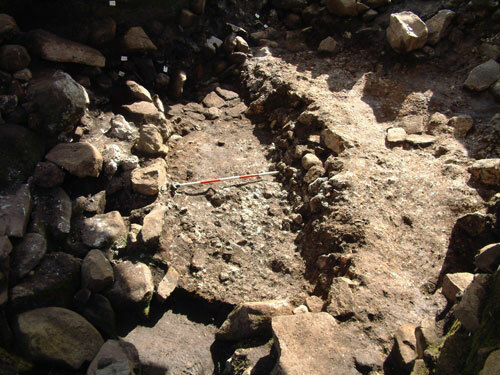 Overall, the excavations in Bone Passage indicate that the main activities and areas of deposition took place around the cave entrance, the base of the stairwell and for around 5 metres in a northerly direction down the passage. The excavations in this cave passage have continued to provide surprises right up until the end. We had always thought that the main cave passage turned at a right-angle at the north end of Bone Passage down the ramp leading into the main stream passage. 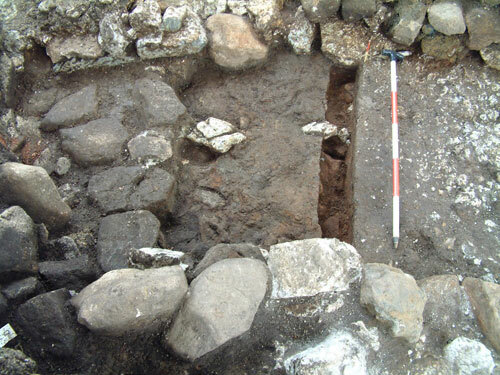 However, with the completion of excavations in this area, we now know that the passage also had outlets in a northerly and westerly direction. These routes, which also would have passed into the main streamway, had been blocked with water-washed sediments, silts and boulders at some time during the Bronze Age to Late Bronze Age period (based on the pottery that these sediments contain). However, this requires further clarification at the moment, depending on the detailed analysis of the pottery by Ann MacSween. 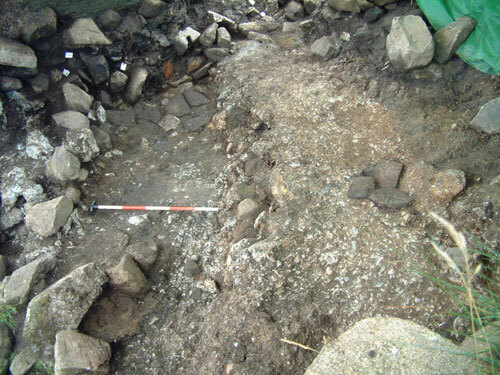 The image above shows the north end of Bone Passage after the completion of the excavated section - the ramp to the main stream passage is off to the right (scale = 1m). The area within the image, containing the boulder and the sediments below, would once have been open passage to the streamway! We now have to clean the passage of our temporary stone dumps, lighting and other infrastructure, before the laser scanning people arrive in October. The scanning will provide a detailed 3-D image of the stairwell, Bone Passage and the adjacent stream passages. Finally, work has proceeded well in Trench 15, where new discoveries continued to emerge right up to the end of the 2008 fieldwork season. The last news update provided details of some new features within these deep sediments immediately outside what then would have been the natural cave entrance (pre-dating the construction of the stairwell). The following sequence of images shows the excavations within a walkway that possibly provided movement towards the cave entrance. 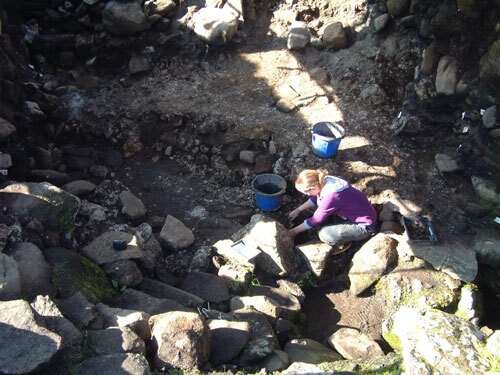 The image above shows Gemma Cruickshanks excavating within the confines of the feature, which is here just starting to emerge. There were few finds in this area, but Gemma did manage to recover a wonderful ‘string’ of well-preserved coprolites - possibly from a large dog, or even a wolf! The coprolites appear to contain fragmented bone and hair/fur. 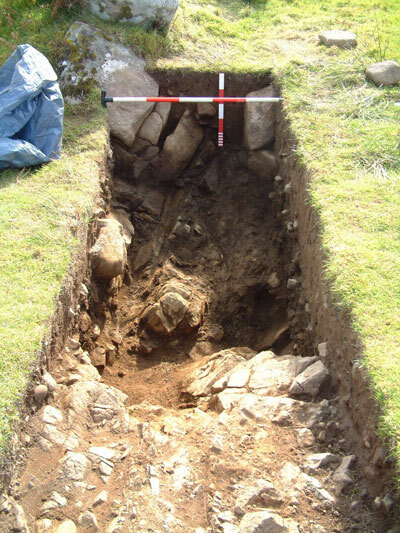 The image below shows the partially-excavated feature with paving at the far end disappearing into the baulk of the trench, interspersed with a layer of compressed limestone fragments, and lined by low stone walls. 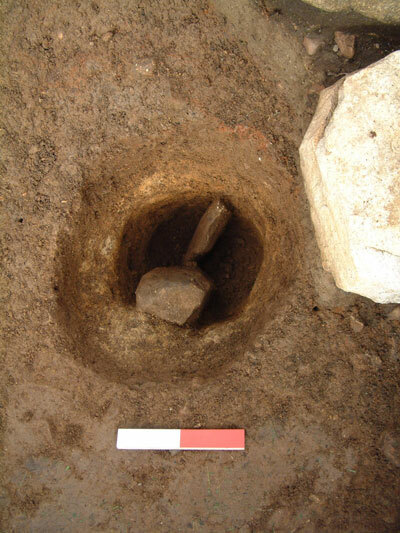 To each side of the feature Martin and Gemma also uncovered a floor surface of compacted limestone, with a small hearth setting set into this (scale = 1m). 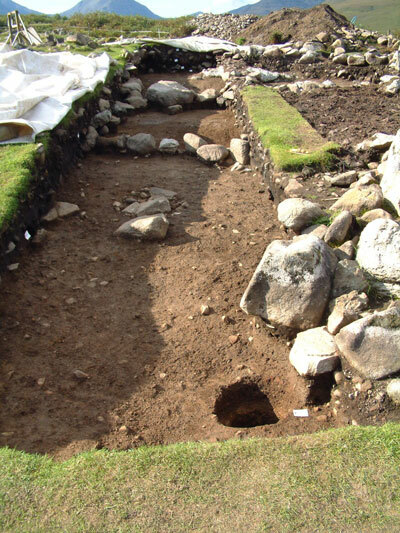 After the removal of a few larger boulders in the fill of the feature and the initial cleaning of the side-walls, the walkway was clear to see - shown to good effect by the light in the image below. 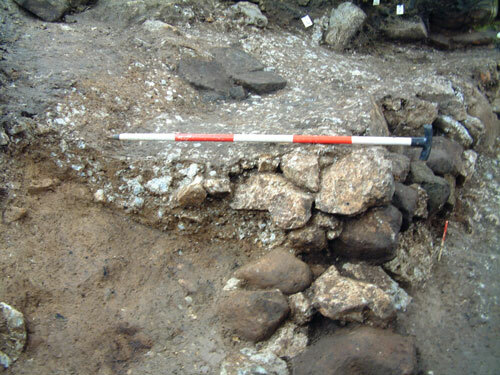 From the excavations undertaken so far, the side walls appear to curve inwards as they approach the large granite slabs that formed the base of the lower massive hearth setting outside the cave entrance - suggesting that the walkway at this phase aproached and terminated at the hearth. However, further excavations planned for this area next year will hopefully provide a more complete picture of the function of this feature. 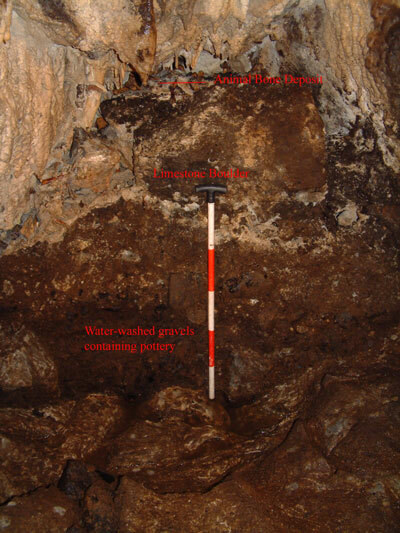 The image above shows a small section excavated through the compacted upper floor layer to the southwest of the walkway, revealing a compacted layer of larger limestone cobbles. After removal, this revealed a further compacted layer of smaller limestone fragments, which finally gave way to a layer of silts containing charcoal flecks overlying the natural karstic clay. After the section was completed, the construction of the low revetment wall comprising this side of the walkway could be cleary seen - see image below. Gemma then started to cut a slot through the interior of the walkway on the same alignment, to investigate the make-up of the interior of the feature. This revealed fine, laminated sediments with some charcoal flecks and small fragments of animal bone. These layers most likely comprise compacted floor horizons, indicating the movement of feet along the walkway. 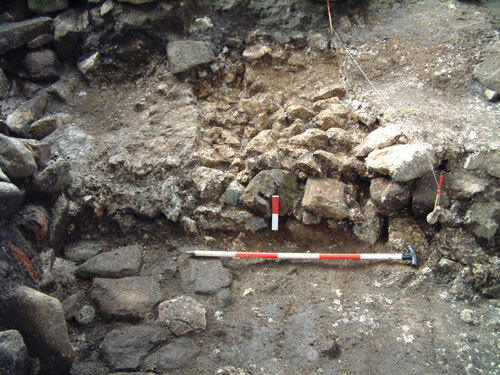 The existing stone paving can be seen to left in the image below, with the compacted limestone surface to the right of the excavated sot. The image below shows the exposed section from the southeast after Martin and Gemma had inserted a Kubiena tin into the laminated sediments. Thin-section micromorphological analysis of the tin sample should provide interesting results with regards to the content of the contexts and any post-depositional morphology.